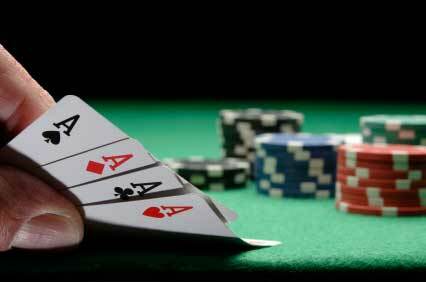 Most online poker sites offer depositing players a variety of cash bonus schemes. Commonly, players will clear their bonus when a required number of ‘frequent player points’ or ‘poker points’ are earned through game play at the site. The bonus schemes fall into one of two categories. Incremental payout; where the bonus is paid in stages as points are earned toward the full amount. Final payout; where the entire bonus is paid upon gaining the full number of required points. Additional offers for depositing players may include exclusive freeroll tournaments, buy-in tournament tickets and merchandising gifts as enticements. Regular players should expect to clear the full bonus or a large proportion of it providing they have average skills, realistic targets and expectations. If you do not have the time to clear a final payout bonus when playing poker at a level you are comfortable at, you should opt for an incremental bonus payout scheme. Choose a site that hosts the games in formats and field sizes you enjoy. Check that the ring games are regularly attended at the times when you will be playing. Many poker sites offer a choice of bonus scheme; so at the site’s bonus information page, decide on a bonus scheme that suits both your bankroll and the time you have available to play. Remember to read the terms and conditions of the offer. Be realistic in your choice of bonus scheme; calculate the number of points you will need to earn per hour (by playing single hands or in tournament fees) and the amount of bankroll you will need to sustain your play throughout the variances of a poker month. Deposit, play with freedom and play to win. With the right choice of bonus scheme you will be enjoying the fruits of your labour in a short time, not fretting over each hand or the tournament entry fee. There is no simple answer, good bankroll management is important. Always deposit and play within your bankroll. I would recommend you to deposit a workable amount. If you deposit the site minimum of say $20 you will mostly be playing against low limit players including those who have scraped together a dollar from freerolls. The balance of play will often be tilted towards luck rather than skill and while you may enjoy a few easy wins, the more freeroll inspired play also brings more bad beats and frustration. When you move up the buy-in levels you will encounter better players; the game is more challenging, and more stimulating. Here are a couple of examples:- In my early days of playing online poker, I deposited $100 at a room that offered a $50 bonus upon clearing 500 poker points. By the time I had released the $50 final bonus my initial deposit had more than doubled. The income did not stack up too well against the number of hours put in, but that was not the point of doing it. What I gained was a good percentage return on the games I played as well as the bonus. My real profit was to enjoy the table time. You can do it too; you don’t have to be a poker genius (I’m proof of that). At another site I deposited $600 in the full knowledge that I did not have the time to clear the entire 100% match up bonus. However, having the headroom of $600 in the account meant I could play more profitable cash tables and higher buy-in tournaments without concern and would pick up the incremental bonus payouts as they occurred. Once you have made your deposit and have begun to clear your bonus, keep a level head on your shoulders. If you have made the right choice of bonus scheme selection you will not feel pressured to win every game and then have to move up the buy-in levels just to stay in touch with your bonus clearance schedule. Your schedule should allow for bad luck going against you as well as a dip in your playing form, so that a few bad results do not compromise your long-term game plan. We all want to win every game we begin and make double our money inside a month, but in reality should be happy to sustain a level or gently increasing bankroll. Then when the bonus is cleared you get your extra reward. For a number of players, the bonus represents a good chunk of their poker profits and that is absolutely fine. If you have a half decent game, sufficient time and have made a realistic initial choice of bonus scheme, clearing all or part of your bonus should not be a problem; you will be able to enjoy your natural game. Many will earn their bonus points by playing several cash tables at the same time. This is fine for experienced poker players; but even then, I recommend you do not commit too much of your poker bankroll in games you cannot give full attention to. You pay the money – you make the choice… but remember to make the right choice.